Krakow is one of the biggest cities in Poland. During my interrail through Eastern Europe, I decided to visit this, for me unknown, city. I'd had never been to Poland before, so I wasn't sure what to expect at all. I'm very happy that I made the decision to visit Krakow, since it's a beautiful city! The food is pretty cheap (yet delicious) and there are lots of things to do in Krakow! It's a perfect destination for a city trip or like what I did, a great stop while interrailing. 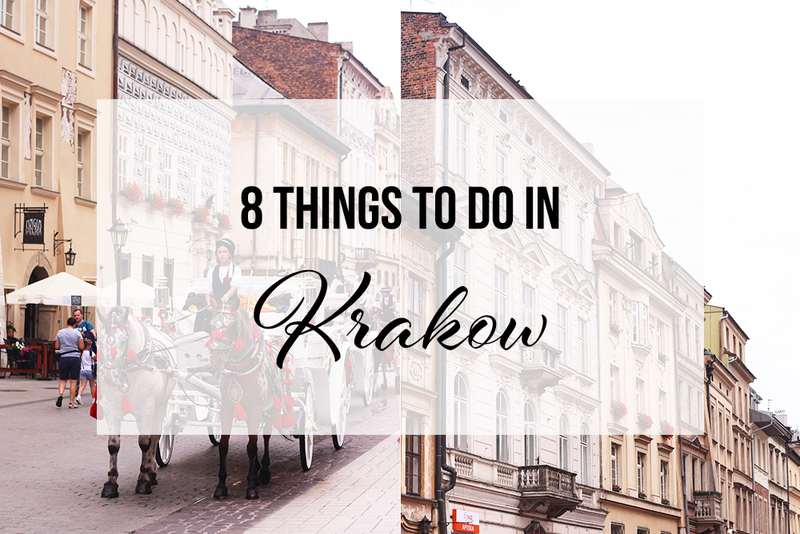 So let me tell you something about the things to do in Krakow! If you're looking for a place to sit down for a while and to admire the surroundings, visit the Main Square. The buildings are beautiful, there's lots to see and lots to do. Most stores are around the Main Square, as well as some restaurants. On a hill in Krakow, you'll find this beautiful castle. There are different buildings that you can go in to. Tip: make sure to be at the castle in the morning so there are still tickets left for the parts you want to visit! This was one of my favorite things to do in Krakow. When you're visiting the Wawel Castle in Krakow, make sure to get a ticket to go inside the Dragon's Den as well. It doesn't cost much and it's a fun thing to do while you're there. There are multiple legends about how Krakow got it's name, but they almost all involve a dragon. Whenever I visit a country/city I've never been to before, I like to try one of the local dishes. In Poland, you should go for Sernik, which is a cheese cake. Sit down in a cafe, order it and enjoy! Of course there are lots of things to do in Krakow, but you can also go on a day trip if you want to. A popular day trip to go on when you're in Krakow is the one to the salt mine. Book a guided tour so you'll get at the info you need! Not that far from Krakow, there is Auschwitz. Pay this concentration camp a visit and learn more about it's history and the second world war. You can go there by yourself, of book a guided tour. Another typical dish that you should try when you're in Poland is Pierogi. These Polish dumplings can be filled with different kind of things, like potato, cheese, meat, onion, mushroom etc. You will probably find this dish on many menus, so definitely try it out! Want a calm day in Krakow, surrounded by the most amazing plants and flowers? Visit the Botanical Garden which is part of the Jagiellonian University. Take your time to walk around and enjoy all the green. Krakow is a beautiful city with lots to do and see. It all doesn't cost that much, which I think is a great plus. I had a great time exploring this city for a few days, and wouldn't mind coming back to this city someday. Have you ever been to this city yourself? If so, what would you say are the best things to do in Krakow?